Why Choose the Educational Technology - Instructional Design for Digital Learning Program? The Master of Education in Educational Technology - Instructional Design for Digital Learning program prepares students to become highly trained instructional designers, armed with the tools they need to bring innovative teaching and training practices into education, corporate, and governmental settings. 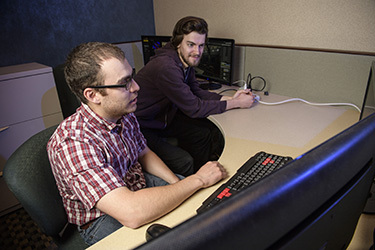 This unique program allows students to combine the two IDDL certificate programs (IDDL-1 and IDDL-2) into one dynamic and engaging learning experience. So, this degree program covers the effective design and implementation of online and blended-learning classes, as well as the research, theory, and research methodologies associated with the effective design of online and blended-learning classes. The entire program is taught in an online environment. All of the classes are designed using the most current research of effective online pedagogies, so participants will not only learn about effective teaching practices but also get to experience them as students. Classes include a synchronous weekly webinar, but sessions are recorded for participants who cannot attend the "live" session. There are ten required courses and one optional internship in this graduate program. Refer to the program of study for the full list of courses. Note to students currently admitted to an IDDL certificate program: To pursue the M.Ed. program, you must apply for and be fully admitted to the master's degree program prior to beginning your sixth course. You must be a degree-seeking student for at least 50% of your program in order to qualify for the degree. Graduate Record Exam (GRE) or Miller Analogies Test (MAT) scores in the 50th percentile or better. Entrance Essay: Please include a short essay with your application that answers the following questions (see below). Your essay should not exceed 1,000 words or two pages (whichever comes first). You will upload the essay to your application. Why do you want to become an Instructional Designer or take these courses about Instructional Design? Please provide specific examples describing your experience using educational technologies, multimedia technologies, or other technologies and how these experiences would help you to become an Instructional Designer. Examples of relevant experience could include, but are not limited to, training classes, certificates, minors, or degrees in these areas. Provide links to examples of work samples or a digital portfolio, if applicable. *NOTE: The entrance essay is waived for those transitioning from the IDDL-1 Certificate to the M.Ed. Option 1: The requirement to take the GRE or MAT exam is waived if the applicant's cumulative undergraduate GPA (from all schools attended) was 3.0 or higher or if the applicant has a previous master's degree. Option 2: The requirement to take the GRE or MAT exam is waived if the applicant was accepted to Wright State University's IDDL-1 certificate program and receives a cumulative grade point of 3.5 or higher for the first three IDDL-1 courses. A cumulative grade point of 3.5 or higher for these three courses must be earned in the first attempt and cannot be earned through course repeats. **NOTE: The student is responsible for all application fees for the certificate and M.Ed. programs. All of Educational Technology programs are currently rolling admission. Apply at least six weeks prior to the term of enrollment. Official transcripts from all colleges and universities previously attended (except Wright State). Official GRE or MAT scores if applicable. EDT 8110 (Learning in a Digital World) is the required first course in the Ed Tech M.Ed. - IDDL program. The attached course guide (PDF) gives a tentative outline of the semesters and terms when Ed Tech M.Ed. - IDDL courses are offered. What IDOL courses have equivalents in the IDDL-1 and Ed Tech M.Ed.-IDDL Programs? If you previously took courses in the Instructional Design for Online Learning (IDOL) certificate program and now desire to complete either the IDDL-1 or M.Ed. in Educational Technology-Instructional Design for Digital Learning program, the IDOL course(s) you took can substitute for courses in the current programs. Note: Students must complete all requirements for a master's degree within seven years.